Congratulations to our week 4 winner… who also caught the Ace of Spades! Week 4 winner caught the Ace! Harold Hobson’s ticket was drawn as the weekly winner, garnering him $84. 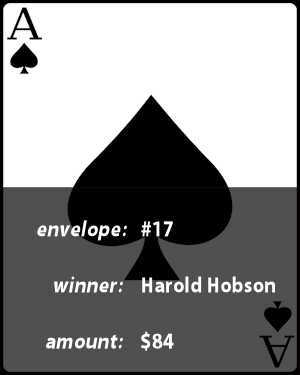 He picked envelope 17, which held the Ace of Spades! That won Harold the jackpot, which after four weeks had built up to $466.50! And now, just as things were warming up, the raffle is over.